On January 24th, 1986, Voyager 2 swept past our system’s seventh planet, Uranus, on its way through the solar system. It was the first and last time we visited the gas giant, and we found it’s one of the stranger locations in our solar system. Throughout classical times, scholars recognized only six planets: Mercury, Venus, Earth, Mars, Jupiter and Saturn, each visible to the naked eye. It wasn’t until the advent of advanced telescopes that anyone found additional worlds orbiting our sun. 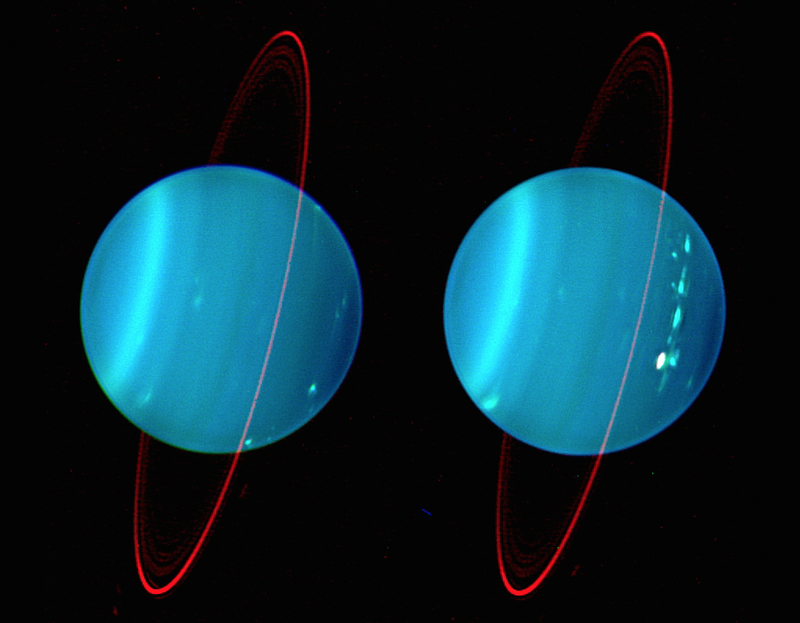 While Uranus is visible to the naked eye, and had been observed throughout history, it had been identified as a star. It wasn’t until March 13th, 1781 when William Hershel observed the planet and noted it down as a comet. It wasn’t until he brought his discovery to another astronomer, Nevil Maskelyne, that they realized that it wasn’t a comet: it orbited the sun like a planet. Additional observations from other astronomers helped confirm the discovery, and Hershel was given the honor of naming the planet. He bestowed it with ‘Georgium Sidus’, or George’s Star, in honor of his king. This, however, didn’t sit well with the wider European astronomical community, and in 1782, German astronomer Johann Elert Bode proposed Uranus, the latinized version of the Greek god Ouranos. However, it would be decades before the name was widely used. In 1977, both spacecraft blasted off and made their way towards Jupiter: Voyager 1 on September 5th, flying by Jupiter and Saturn before it made its way out of the solar system. Voyager 2 launched on August 20th, and flew past Jupiter, Saturn, Uranus and Neptune, on its way out of the system.